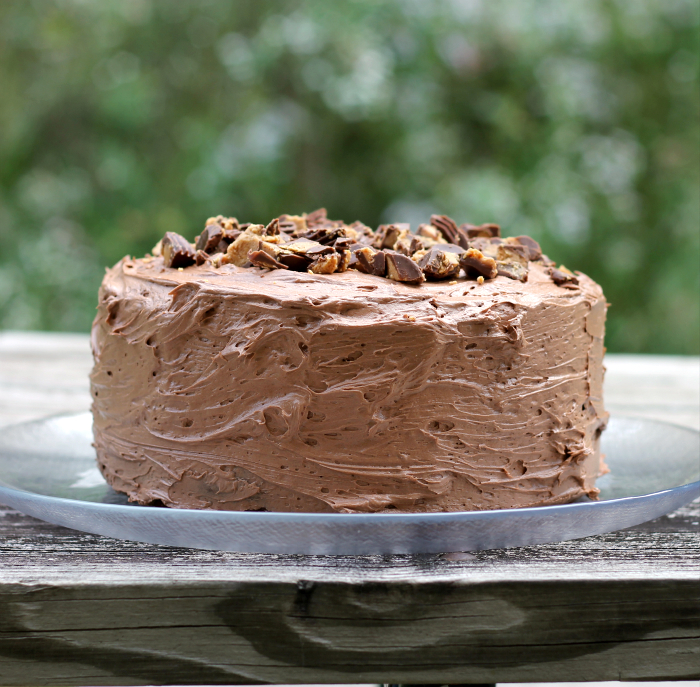 Buckeye fudge layer cake is a moist chocolate layer cake with creamy buckeye peanut candy. I have made buckeye peanut butter for Christmas for so long I really can’t remember when I didn’t make them. The creamy peanut butter center makes these candies irresistible. 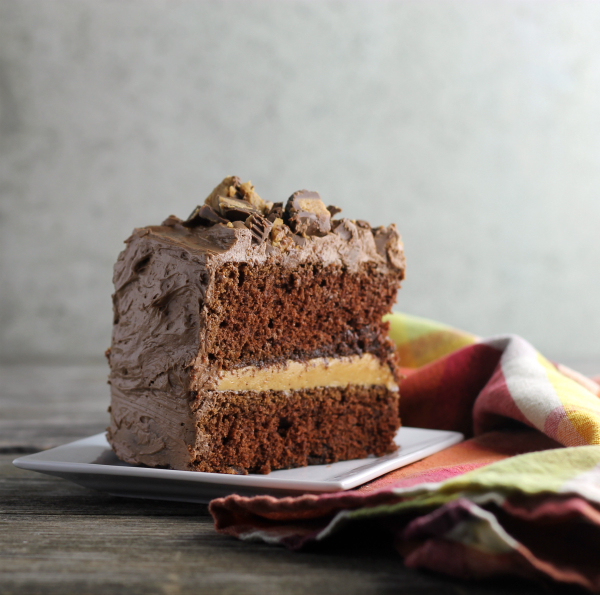 This buckeye fudge layer cake has a layer of that peanut butter filling; making this cake just as irresistible as the candies. I made this buckeye fudge layer cake for our son Jon’s birthday. No, he didn’t request a chocolate cake with a peanut butter filling. He requested the same cake that he does every year; a Jell-O cake. You know the yellow cake that you poke holes in the top of it and pour Jell-O over the top of the cake, and then it topped with cool whip. You know what the funny thing is when birthdays roll around in our family? Our kids never request birthday cake. Well, except for Jon’s Jell-O cake. They always request some other dessert. I guess you can say that cake is not always on the top of our list for desserts. But the buckeye fudge layer cake is another story. 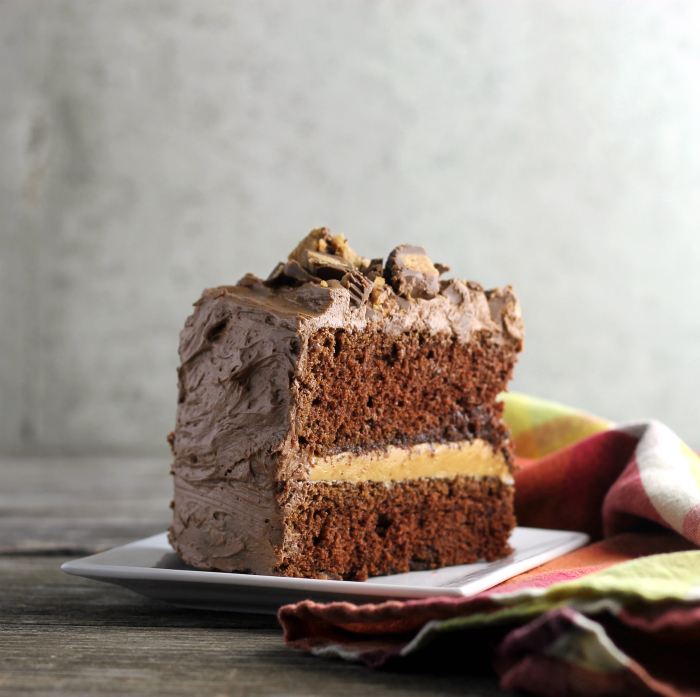 The creamy peanut butter filling is tucked between two layers of chocolate tender moist cake. On top of this is a creamy frosting and chopped peanut butter cups. I heard no complaints when the desserts were brought out. Do you like the combination of chocolate and peanut butter? Well, get baking. You will love this buckeye fudge layer cake. Place the evaporated milk in the refrigerator to chill. Cream the butter and sugar together. Add one egg at a time and beat until light and fluffy. Sift together the flour, baking soda, cocoa, and salt. Add a third of the flour mixture to creamed mixture alternating with evaporated milk. Divide the cake batter between the two prepared pans. Place in the preheated oven for 30 to 35 minutes. Remove from oven and cool for a few minutes and remove from pans. Cool completely on cooling racks. In a medium bowl add the powdered sugar, peanut butter, and butter and beat until smooth. In a medium bowl add the ingredients and beat until fluffy. Place on of the cakes onto a cake plate or platter. Spread the peanut butter over the top of the cake evenly. Place the second cake on top. Spread with the chocolate frosting. Top with the peanut butter cups. Cake recipe-source: adopted from a church cookbook from my mother. Love chocolate with peanut butter and crave it all the time! This cake looks wonderful, and definitely worth for a birthday celebration. I am sure your son was happy! I’m going to bake this at our next family get together. Sarah loves buckeyes! My family always requests cake for their birthdays—but I’d rather have pie 🙂 My oldest would be thrilled for this buckeye cake for his b-day. I need to keep this one in mind. It looks fantastic! What a beautiful looking cake! 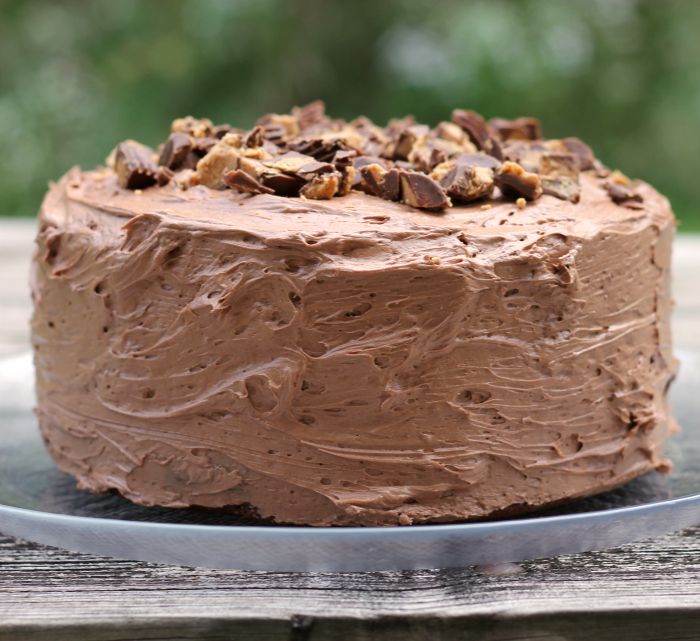 I love the milk-chocolate cake, and I especially like the texture of the frosting! It looks delicious! Wish it were my birthday!